For three weeks, Performa biennially organizes more than 100 separate performance art events, presented at over 40 venues across New York City. A consortium of arts institutions and curators connect to “break down the boundaries between visual art, music, dance, poetry, fashion, architecture, graphic design, and the culinary arts.” With so much to choose from, I decided the Performa 13 event Frank Haines presents Zeena Schreck: Live from the Eye of the Storm was a must-see. The November 8th one-night-only event did not disappoint. Upon entering the First Community Church of New York, I overheard a pentagram-clad fellow lament,“Whaddya mean she's not a Satanist anymore? 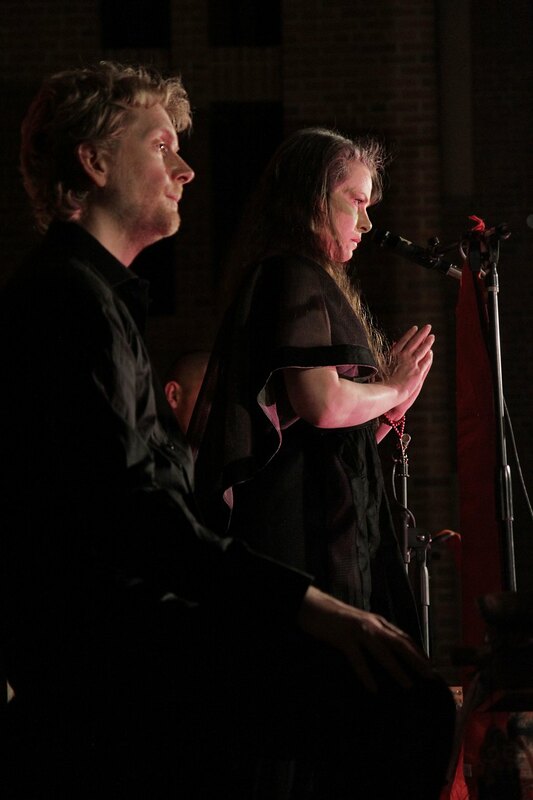 !” A woman explained that rather than any Satanic sacrament he'd hoped to witness, Zeena would present ritual-based, sacred syllabic chants accompanied by musicians Hisham Bharoocha (of Soft Circle) and Anders Hermund, on a stage set by artist Frank Haines. Zeena is a practicing Tibetan Buddhist yogini (in the Drikung, Karma Kagyu and Nyingma lineages), so the disappointed Satanist's query might seem strange to those unaware of her history. Although she no longer aligns herself with her past, Zeena is the daughter of Church of Satan founder Anton LaVey. She received the first ever Satanic baptism at the age of three and was the CoS's High Priestess from 1985–1990. Prior to her disavowal, Zeena appeared on numerous talk shows (Sally Jesse Raphael, Geraldo, Donahue, etc.) to publicly defend her father's organization amidst the Satanic Panic of the late '80s. Her striking looks and intelligent demeanor attracted a following that remains strong 25 years later. Although I initially went to see Haines' stage, I love Zeena's backstory. With these two, I should've anticipated encountering a fascinating crowd. In addition to the aforementioned attendee, the pews were packed with Anton LaVey doppelgangers, witchy-looking women, and several well-known artists like Matt Connors, Mariah Robertson, Peter Coffin, Tauba Auerbach, Mary Manning, and others. Walking down the dark center aisle, the transformed alter beckoned me. 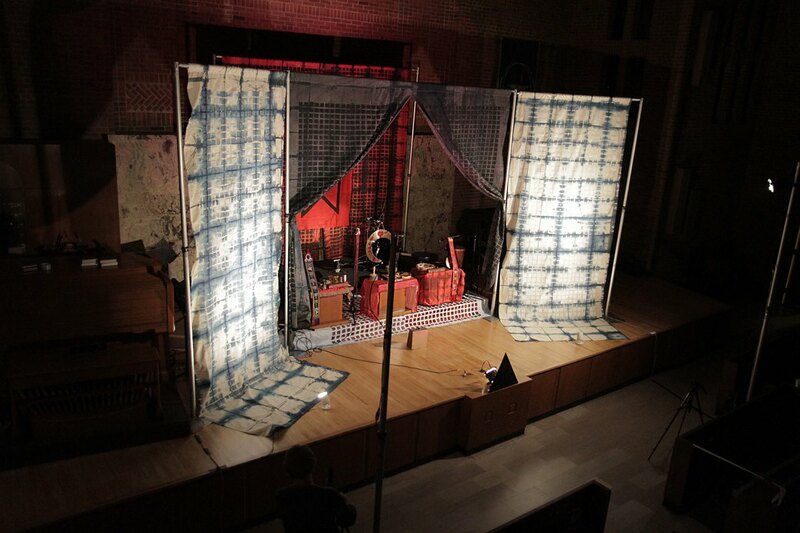 Imposing fourteen-foot tall curtains brandishing an exquisite black-on-black hand-painted grid were flanked by vibrant white gridded and indigo dyed fabric panels. Settling into my seat, quietly cracking open a tallboy of Coors, the dark and ominous stage enveloped me. People whispered softly until a surprise appearance by Chris Kachulis silenced the crowd. Anticipation grew as he walked towards center stage to announce that we were not there for secular entertainment. We would be witness to a sacred rite in a house of worship. According to Zeena's teaching, we should remain fully focused on the present moment, experiencing the event through direct, undistracted transmission. Jingling bells and padded footsteps echoed in the darkness. The curtains silently parted, dramatically revealing an electrified, vermilion environment. Dead center, with hands held in the Mudra position, stood the seemingly twenty-foot tall goddess Zeena. With a painted gong behind her, Bharoocha and Hermund adorned her sides. Bharoocha lit incense that swept through the audience as Zeena's commanding gaze pierced us all (everyone I talked to after the show swore she was staring directly at them). Zeena towered over us in a powerful, haute couture black vestment designed by Ohne Titel. (The fashion duo is known for collaborating with other artists and musicians, such as Tauba Auerbach and Antony and the Johnsons.) Seamlessly, a sound and voice collage emerged from the trio. 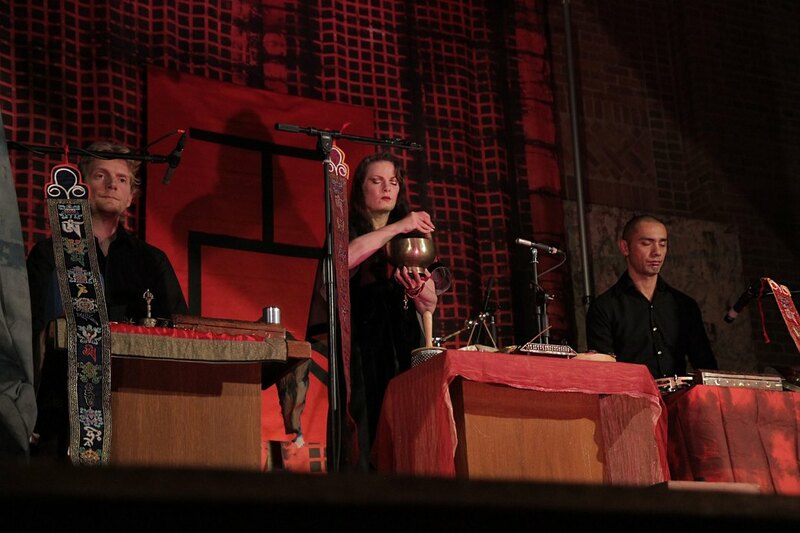 Zeena began by activating a large singing bowl. 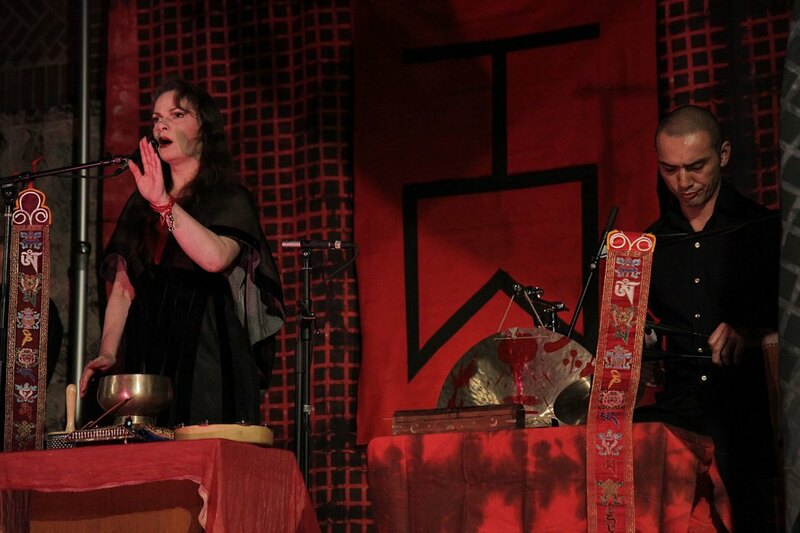 As she began to chant in an unidentifiable language, musicians Bharoocha and Hermund masterfully maintained the rhythm. With Hermund staring straight ahead and Bharoocha's eyes closed, both seemed deep in trance. The healing process of sound and vibration washed over me and I relaxed into the spellbinding show. What initially seemed like songs, I learned was a series of mantras. Each psalm mandated a new combination of auxiliary percussion instruments. I've never heard so many different types used in a single performance–a stream of hand drums, rattles, bells, Dhols, Afuche/Cabasa, damarus, Brass Tibetan Dripu Bell and Dorje mesmerized the congregation. My favorite point of the night was when Zeena evoked a wrathful god in the form of a bird. She suddenly looked like a raven. She embodied this entity with head cocked to the side, crying shrill ca-caws. The entire ritual lasted approximately 45 minutes and I left with a bewildering calm, peace, and awe. Five more nights of Performa remain. As for those interested in seeing more of Haines' work, a few opportunities exist. Currently, an exhibition at Bushwick's Jackie Klempay Gallery titled As a Shadow Smiles, features frequent collaborators Haines, Reuben Lorch-Miller, Christopher Garrett and Robbie McDonald. Also, Haines launches a book of interviews with 23 fellow artists and scholars (including both Lorch-Miller and Garrett) this December in Miami during Haines and Garrett's exhibit at the BFI. As for seeing Zeena again, the notion strikes that this was a once-in-a-lifetime occurrence. I must let whatever vibrations I absorbed from the High Priestess feed me for as long as possible.